Enjoy the best that a personalized and privately owned villa can provide. Located 100 yards from two golf courses and a 12 minute walk to the Sea Pines Beach Club. High speed wireless internet is included. Villa is well equipped with all linens plus full kitchen. Beach towels and chairs are included also. Fitness center, both indoor and on site outdoor pools. Ask about a $49 Family Fitness Center pass which includes access to an indoor pool, spa and health club facilities. Full equipped kitchen. All linens are provided, including beach towels. Beach chairs are also included. We were more than pleased with this condo! The photos don't do the place justice - it is gorgeous! Wonderful dog friendly option. The fees are a little high, so the nightly price may be a little deceiving, but it is worth it. Right in the heart of Sea Pines. Very close walk to Sea Pines Beach Club. Located directly on the bike path makes it really easy to run or bike Harbortown and South Beach Marina. We wish we had more time, and slightly better weather to fully enjoy - but would highly recommend and would definitely rent again! Lovely condo; Close to beach and in the heart of Seapines. We loved how open and spacious the condo was with easy access to all Seapines has to offer. Very dog friendly and the bathrooms were gorgeous. This property was perfect for our family of 5 with plenty of room for everyone to sleep comfortably. Bathrooms are gorgeous! The location worked out well for going to the beach and shopping with the included bikes making it easy for adults and teens to go our separate ways. Our dog loved chilling out on the cool tile floor after romping during "dog time at the beach". 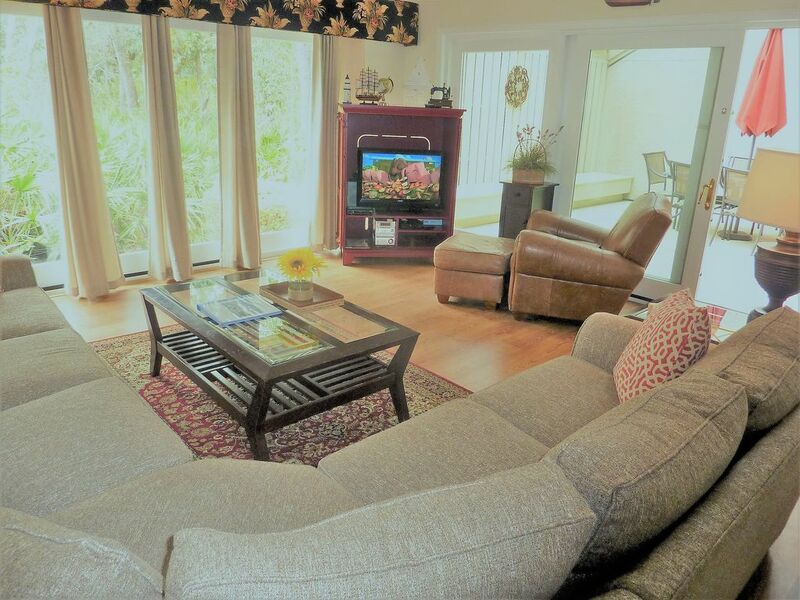 Sea Pines is one of my favorite places to vacation and this home made it easy and comfortable. Can't wait to go back! Very nice property. Close to beach, pool and trolley stop. Very nice property. It was very clean, and bigger than expected. Close to the beach, pool and trolley stop. Would definitely rent again. We had a great time staying in this condo, it was bright and open. It had everything that we needed, and the location could not have been better. The pool area was right across the parking lot, and we rarely saw others there. Thanks! Unit was in a small, quiet community very close to the Sea Pines Beach Club. It was pet friendly and included the use of two bicycles which came in handy for exploring the community.